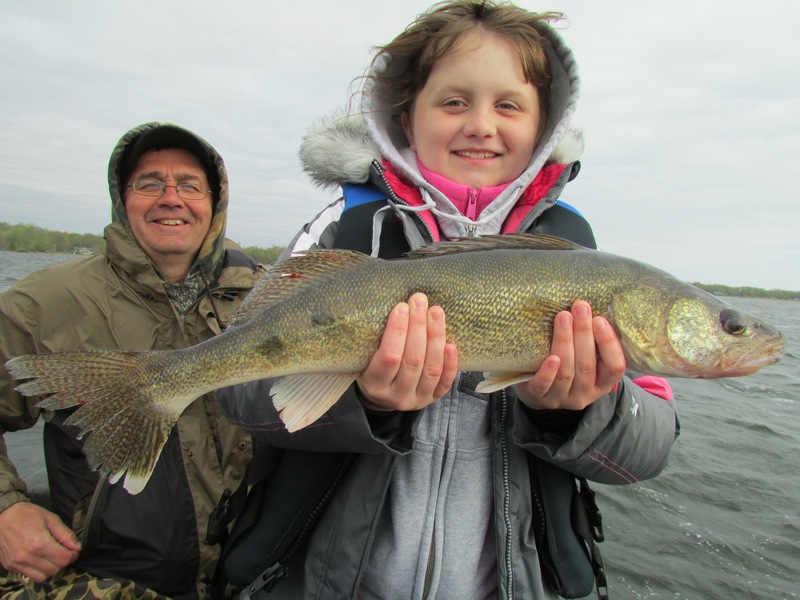 Here’s Laura Beltman with her 23 inch walleye. After the photo, the walleye was gladly released. The Beltmans, from Orange City, Iowa, braved some more crappy weather over Memorial Day weekend. The fishing has been exciting this spring, weather and all. What do I do with the weather? I just ignore it all together. Yup, I simply get in my truck every morning, drive to where ever it is I’m supposed to meet my group, then drive to the access, get in my boat and take every body fishing. When it’s windy, I simply drive slower so I don’t soak every body or pound everybody on large capping waves–fishing’s no fun if you’re beat to hell–just drive slow. As for the fishing and boat control; that’s the easy part. The wind was 25 mph from the SE and I had the Beltmans fishing the NW part of the lake–it was rough. My Lund 2010 and big Mercury Verado just sits easy and free in those conditions. Why more folks don’t fish on those windy days is beyond me, but that’s OK, I usually have the whole lake to myself and it sure is peaceful and very productive. The walleye that Josh and Laura caught in the pictures above, came about an hour apart. They caught them on night crawlers–which is a bait I prefer as it hooks more fish. When I’m forced in to using minnows, the hooking percentage is very low–frustratingly low–so I try to get crawlers working as soon as I can. And it works. 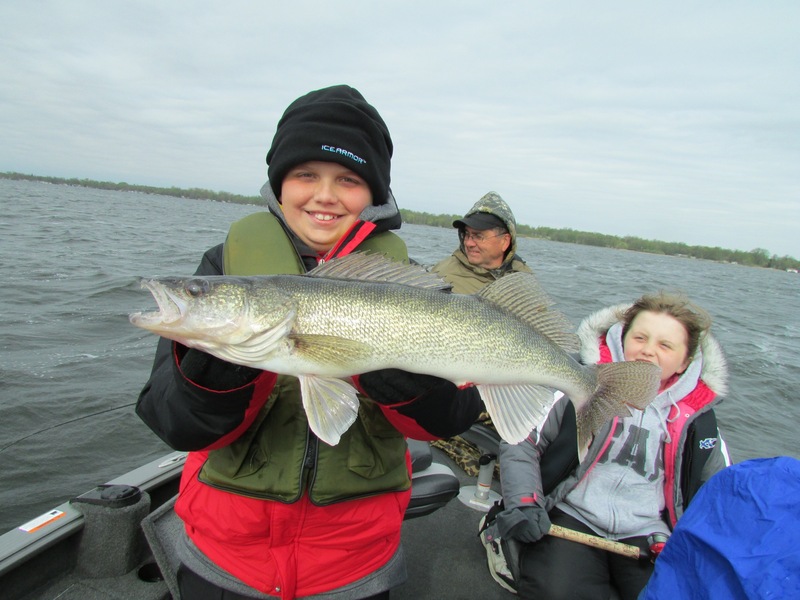 The proof is in the pictures–two youngsters and two very nice walleye, and both walleyes as swimming free to spawn another day. Fish Good. Here’s a Humminbird shot I took last week when I was with the guys from Kansas. It looks pretty plain, but when ever I saw that type of set-up that morning the walleye bit. 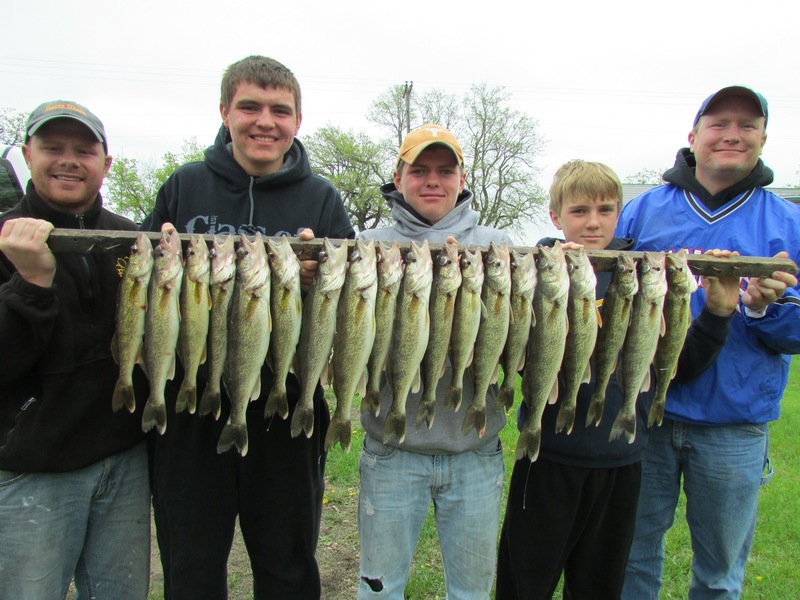 Several of the walleye in the Humminbird photo are on the stringer board. 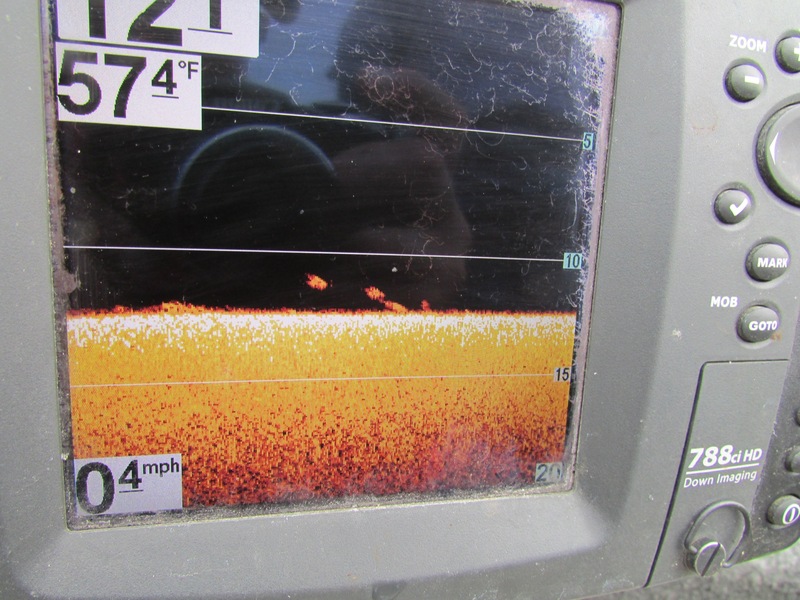 Note that the walleye on the Humminbird are not “arcs.” Rather, they are what I call “blobs” or “jelly beans.” The reason I identify these jelly beans as walleye is because of their proximity to the bottom and by how tight they group. Bass will often sit in groups like this and they are very similar in size, but they are almost always situated two to three feet off the bottom and individual bass will also get as high as five or six feet from the bottom. Suckers seem to be the only species this time of year that can look exactly like walleye–so if you don’t get a bite after some decent effort and fifteen minutes of time, just leave them. Don’t let really nice fish images like this keep you in one spot all day. Fish Good.